UP+50% » Website usability » What to Do If Traffic From Google Adwords Doesn’t Generate Sales? This question bothers Internet marketers who faced the situation when contextual advertising was properly set, there was traffic from Google Adwords but no sales. Within the online conference WebPromoExperts PPC Day, which took place on April 13, 2018, Andriy Chorny (CEO of Plerdy) spoke about several possible reasons for low sales and offered effective solutions. Website usability is one of the key factors that define whether users will make certain actions. The more convenient and logical a web resource is, the higher conversion rate it has. However, this simple rule is often ignored. The way your online store looks and feels is as important as its content. To clarify the reason for low sales with consistent or even growing traffic, you should analyze the usability of your online store. What are the stages of a usability audit? The first impression of a website: What do your potential customers see during their first visit? Is your design clear? Technical evaluation: Check the quality of testers’ work (if there are no bugs or layout issues). Conversion path evaluation: Check how easily users can navigate between the pages of your online store or, in other words, go through a sales funnel. When you assess website usability remember to analyze both mobile and desktop versions of your web resource. If your online store has a very limited selection of products, potential customers will just leave it. Such situation can be compared with the behavior of consumers in a supermarket: When there is a bunch of products and they are organized and well-presented, people will buy them. Whereas shelves with one or two items won’t probably catch the interest of potential customers and won’t make them buy at least something. The more you neglect photos on your site, the higher bounce rate you will have. Appealing high-quality images are the most crucial requirement for online stores. You should have enough photos and they must clearly demonstrate the quality of an offered product. Don’t be carried away with fancy elements of design, as not all of them are understandable to users. For example, a menu button, which is often called “hamburger”. Our experience shows that the absence of the “Menu” word under an icon, results in a three-time lower click-through rate. If the main banner on a website doesn’t include a call to action, it’s absolutely useless. In case of online stores, it’s extremely important to motivate users and clearly show them what will happen once they follow a banner. Obviously, its author wanted to tell about a sale and tried to choose a stylish image. Unfortunately, it hasn’t produced the expected effect. A product page must have a full description of characteristics, photos, reviews, and all other information that can dispel users’ doubts. Try to keep the balance with it: tell customers what they need to know but don’t overburden them. Based on our own experience, I can state that this also happens. For example, during an audit, we have found out that a customer had no sales despite having spent on advertising about $3000. When we got to a Google Adwords analysis, it turned out that the ads were displayed for 12000 words! In this case, even website usability won’t help, as the ads were bringing an untargeted audience. A website speed is one of its most important characteristics. Besides visitors, a slow site also loses its ranking in search engines. So before you start any advertising campaign, make sure your website works properly. The recommended loading speed is up to 3 seconds. This has already been said and written a lot. A responsive layout is a must. The audience splits in half. In this case, mobile traffic obviously dominates. Maybe the thing is that such request doesn’t indicate what spare parts are needed. 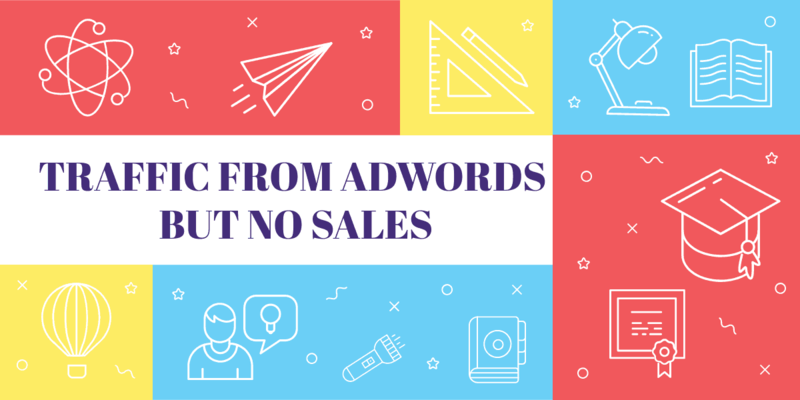 Google Adwords may also fail to generate sales for untargeted pages. For instance, on this page, six out of ten products aren’t related to the subject. Using Plerdy heatmap, you can define which elements work and which don’t. To do this, your site must have traffic and user interactions with its content. In this example, all clicks are almost evenly distributed, so no changes are necessary. Here is another interesting case we have come across making a usability audit. On the website of a travel agency, there is a part of a page with three big images. One of them (“Last minute tours”) has got 43 clicks. This means that users perceive it as clickable and think that selecting it will take them to the corresponding window (which doesn’t happen). In this case, think about changing your page to make it more interactive. For instance, a click on each block may lead to the related category with tours. However, despite the original solution, nobody clicks on the emblems of cars. Moreover, nobody uses the filters. Most probably, users just don’t fully understand how these elements work. The unusual design results in quite a poor conversion. On many websites, they add a banner for a newsletter subscription. The experience shows that if you do this without using an appealing call to action and place the banner block on a sidebar, nobody will subscribe. Working with websites, we often come across forms with numerous fields. As we have already mentioned, the fewer fields, the better (leave only those that are necessary to place and deliver an order). This example depicts the form of an online store which doesn’t take into account the priority of shipping methods. Judging from the number of clicks, their order should be changed. For quick detection and comparison of effective and ineffective elements, we recommend using Plerdy dashboard. So what can be done to prevent pouring your advertising budget down the drain? If your website has traffic and you also want to use Google Adwords to increase sales, start with a usability audit. You should know about possible issues with the site before your paid visitors do. There are several stages of a usability audit. Whereas you can make a visual evaluation of a site without any additional tools, the assessment of conversion paths requires a click heatmap. Select an effective interface (take into account the type of your target audience). Today online stores have a lot of competitors. To attract the attention of your customers, you must know them and take into account how your website is perceived individually. Here is when a usability audit can help you.